An essential guide to the calibrated risk analysis approach. The Failure of Risk Management takes a close look at misused and misapplied basic analysis methods and shows how some of the most popular "risk management" methods are no better than astrology! 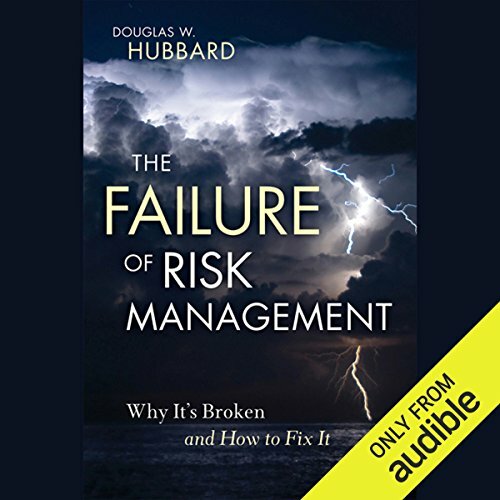 Using examples from the 2008 credit crisis, natural disasters, outsourcing to China, engineering disasters, and more, Hubbard reveals critical flaws in risk management methods and shows how all of these problems can be fixed. The solutions involve combinations of scientifically proven and frequently used methods from nuclear power, exploratory oil, and other areas of business and government. Finally, Hubbard explains how new forms of collaboration across all industries and government can improve risk management in every field. ©2009 Douglas W. Hubbard (P)2012 Audible, Inc.
Where to start. I thought that this book was worth listening too, there were definitely some points that I hadn't considered in my career which I thought were worth following up. But there was a lot that grated against a nerve for me. My job is in safety, which Hubbard refers to as 'low level organisational risk' and I think it's most safety practitioners view that while a work place fatality may not kill the organisation, morally, calling it 'low level' sends out the wrong message. Hubbard then pretty much lambasts the common risk scoring methods that we 'Low level' users love so much in favour of his preferred risk measurement tool 'The Monty Carlo Method' (there is a point in the book that for about an hour it feels like he is just repeating the words 'Monty Carlo Method' over and over. Hubbard must manage to get it into every sentence about 3 times.) Hubbard also goes on to say that managers of 'high level organisational risk' are not using any method of risk assessment at all. So what does it matter if the low level are using something that possibly is not exactly accurate. Then my final irk were the examples of safety incidents used to illustrate points, seemed to be from cases where there was a risk known, or highlighted, but ignored, resulting in catastrophe. Where Hubbard's point seemed to be that had the risk been better analysed that the outcome might have been different. I am not sure that I would agree. Sometimes people just think they know better. Anyway, I will be looking into the Monty Carlo method, despite Hubbard's attempt to put me off.